Following the outdoor festivities, the HHCGOC showcased beautiful vibrant paintings created by local Hispanic artists in the lobby of the Orange County Administration Center. The HHCGOC also accepted a proclamation at the BCC meeting acknowledging their efforts to promote and highlight the contributions made by individuals of Hispanic descent in Orange County since 1999. To continue celebrating Hispanic Heritage Month, the HHCGOC is hosting the fourth annual Mayor’s Cup Soccer Tournament Finals on Oct. 21, 2018. The tournament and trophy ceremony will be held at Young Pine Park, 5201 Young Pine Rd. from 9 a.m. to 2 p.m. The series of youth and adult matches began on Sept. 16, 2018 and the tournament finalists will compete to win the Mayor’s Cup. 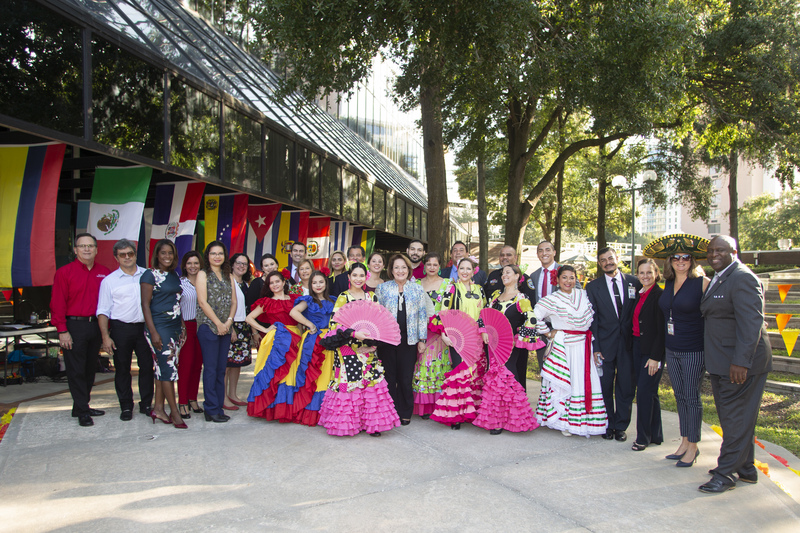 Photo Caption: The Hispanic Heritage Committee of Greater Orange County joins Orange County Mayor Teresa Jacobs, the Board of County Commissioners and performers from Spain, Colombia and Mexico on the lawn of the Orange County Administration Center, for their annual Kick-Off Party to celebrate the beginning of Hispanic Heritage Month on Sept. 18, 2018.